Call us to schedule a design consultation from our CourtBuilder™, but while you’re waiting for our visit, think about how you’d outfit your court for all the sports you like to play. 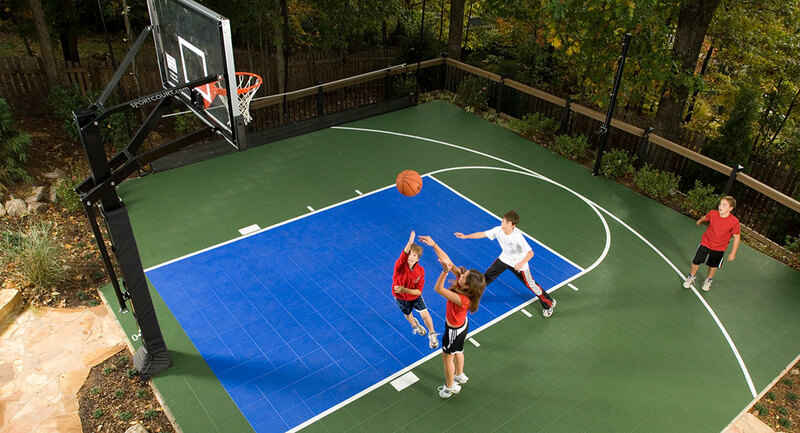 With Sport Court’s® components and accessories, you can design your court to reflect exactly how you will use it. Not sure what to consider when building your court. Here are some great tips to help you out! 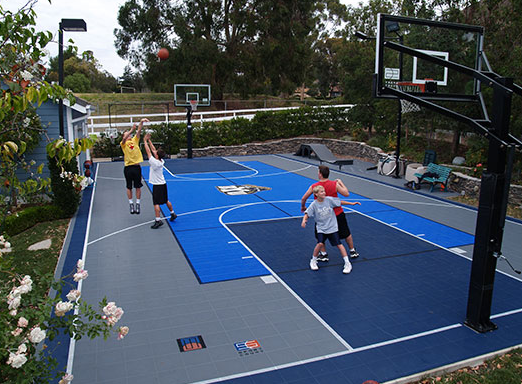 Installing a game court in your backyard can be the best investment you can make for you and your family. The list goes on; the changes we have seen in family life with the installation of a game court are remarkable. However, there are important considerations to be taken before you decide. What sports are they currently involved in? What sports do you see them playing in the future? On a typical mid-sized multi-purpose game court as many as 15 games can be played. Shifting from one to another is typically very easy and fast. To a large extent, what you play will determine the size of court needed. If basketball is your family's primary sport, a 3 point line may be important. At 19 ½ feet from the rim a full 3 point line requires a court at least 25x45 feet to allow a player to shoot from behind the line. This configuration allows for half-court basketball with full court volleyball and other net sports on the same court. 2. 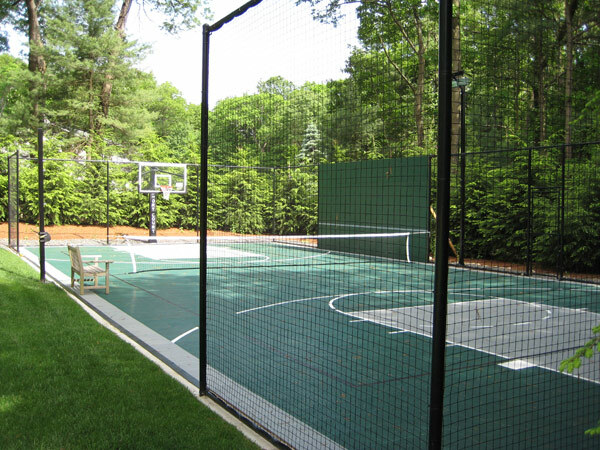 Space - How much space do you have on your property for a backyard court? Wetlands will require additional steps to follow. However, we have handled many difficult situations and have still gotten the courts approved. The largest flattest space will require the least amount of preparation. If not flat, we can slope the area of the court or build a retaining wall if necessary or wanted. Other than that you should be able to design and build a fantastic backyard recreation center that your family will enjoy for years. Assuming you can get the appropriate permits from your town. 3. Permits - Does your town require a permit to build your dream court? Building a court is a unique major construction project in your backyard. Choosing the right contractor is critical. Now that you've chosen a court builder here are some things they should discuss with you. If they don't, it should set off some internal alarms bells. 5. Access - How are they accessing my backyard? Building a court in your yard is a major construction project therefore access to the space is crucial. 6. Sub Base - How are they preparing the sub base? The contours of your property will determine the amount of work required to create a large flat area. 7. Base - What are they using for a base? This will create the hard flat surface from which you can build your court. 8. Athletic Surface - What athletic surfaces can I choose from? "Let them play on concrete, that's what we did" is a common refrain. Unfortunately, the more kids, and adults, play on concrete the more injuries in particular to the growth plates and joints. 9. Manufacturer - Who is the manufacturer? Are you dealing with a reputable high quality manufacturer? What sort of quality control processes do they have? How many courts do they have installed? How do they look after a few years? What is their distribution strategy, who sells, installs and repairs? 10. Warranty - What is the warranty? Sometimes things can go wrong with any surface, be sure to read the fine print on any warranty to ensure yourself a long happy relationship with your new court. Has the manufacturer been in business longer than their warranty period? We hope this guide was helpful and a worthwhile use of your time. We look forward to seeing you out playing with your family soon. © Sport Court MA. All Rights Reserved.